Journalists, who initially tried to cover the collapse of a building inside the premises of Synagogue Church of all Nations, owned by Prophet T.B. Joshua, saw hell in the hands of the church members. The church members descended on journalists, who tried to take any photograph of the collapse building. Some journalists got their cameras smashed and other were seriously beaten for attempting to steal some shots of the collapsed building. A particular TV station had the windscreen of its car smashed by the members. What they were trying to hide is still difficult to understand. By the next day, obviously having read the reports on some of the newspapers, Prophet T.B Joshua surfaced and tried to do some damage control. He invited journalists, who had returned to cover the rescue effort, despite the treatment they got the previous day, to his office in the church premises for a meeting. First he instructed all the cameras to be turned off on the grounds that he doesn’t want his face to be seen and that he was not properly dressed. Then he went to blatantly deny his church members were responsible for the treatment meted to journalists the previous day. He blamed the act on the people of the community absolving his church members. And then out of his ‘benevolence’, he apologized for what the ‘people of the community’ did. Done with the apology, he then went on to detail what could at best be described as a conspiracy theory as being responsible for the collapse of the building. The building itself had been partially completed and people had been living in it. By this time it was a four-storey building. And then sometime this year, the church decided to add two more storey. People were living in the building while work was going. That accounts for the huge number of causality. But Prophet T.B Joshua sees things differently. He told journalists that five minutes before the building came down, a mystery plane had hovered above the building about four times. Please take your time to listen to the video as Prophet T.B. tells his tales. As unbelievable as it may sound, you read that correctly – he has claimed that a mysterious plane or helicopter flying close to the church compound caused the building to collapse. Even if we entertain this ridiculous hypothesis for one moment, it still doesn’t let SCOAN off the hook one iota. Is he saying that the buildings on his multimillion dollar church compound are so shoddily built that the noise of a nearby aircraft could cause it to fall? Or is he saying that the UFO had some alien, invisible ray gun technology that remotely disintegrated the foundations of the building? Far be it for us to make fun of this dreadful situation, but how else are we meant to understand his explanation? Workers and visitors were housed in this unfinished building before it collapsed. Secondly we should note that not once did TB Joshua express any sympathy or remorse for the senseless deaths caused by his shoddy buildings. Nor has he even acknowledge that anyone had died, even though official numbers are now listed at 17. Instead he waffles on about madcap conspiracy theories based on the fact a mysterious surveillance camera was discovered on the church site, and an unidentified flying object was nearby when the building collapsed. The deaths were incidental to him, the real victim of this attack is TB Joshua. You can see exactly this attitude on the TB Joshua facebook page, I challenge anyone to find a single comment expressing sympathy to the bereaved families. How will the Nigerian government react? Numerous times we have expected the Nigerian government to take a stand against TB Joshua’s shameful and embarrassing antics. We called for him to be arrested when he pretended Boko Haram were trying to bomb his live service. By the governments own words, he should have been locked up after promoting his anointed water as a cure for Ebola. According to the law in Lagos, any building that collapses during or after construction will be seized by the government. 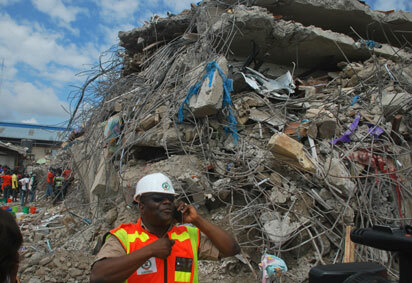 The General Manager of LASEMA (Lagos State Emergency Management Agency) was asked whether the state government was considering revoking the land title in accordance with the policy on collapsed buildings, he could not give a definite response. He simply said the state government had commenced investigation into the possible cause of the collapsed building for appropriate action to be taken (source). If one building at SCOAN has been built without following proper regulations, it is very likely that others have too. The government should immediately order a full inspection of all buildings and related documentation. Regardless of what may be said by TB Joshua, it is quite clear to any rationally minded individual that this tragedy was caused by unauthorised and unregulated building work, and allowing people to live and use a building that was still under construction. It is also quite clear to any rationally minded person that the alternative hypothesis presented by TB Joshua is verging on insane, and shows his complete lack of respect and compassion towards his victims. Our heartfelt sympathies and prayers are with those who have lost loved ones. We pray that it might not be in vain, and that other similar tragedies will be avoided by measures taken in the light of this one. This entry was posted in News and tagged arrestTBJoshua, SCOAN building collapse, SCOAN disaster, TB Joshua building collapse. Bookmark the permalink. My own comment is that the owner of this website is as stupid as a goat. Go find something doing and stop wasting your time. I can see you are jobless. May God forgive your for permanently Judging a MAN OF GOD. Who are you to Judge???? especially a MAN OF GOD, Go and repent my friend and find something doing, rather than sitting on your computer and typing nonsene. My contribution to this well intentioned forum in spite of its fanatic criticism from the fundamental followers of the “synagogue online community” is to proffer a serious legal “class act” solution for the bereaved family members of the injured and deceased victims of the collapsed building be they Nigerians or foreigners with whom I deeply condole for their irreplaceable loss. I was once a victim of human right abuses for no apparent cause from those violently hostile thugs & touts a.k.a synagogue church members & security and would have sued their prophet to the highest court for the highest damages per se but was restrained from doing by the Lord which I once reported on this forum. In your case this is clear homicide if proven that the said building had no council permit to be raised from two floors to a skyscraping six floors leaving it with such a weakened foundation that inevitably gave way and caused it to collapse like a pack of cards as we saw in their own propaganda “home video” claiming it was a terrorist attack of a “silent bomb” that can bring down such an edifice without smoke or fire. Even the CIA would be interested in such a weapon that apparently was “dropped from sky” by that strange aircraft that coincidentally flew over the building before it went down. That is if they are “deceived” fan club members of the synagogue church. Unfortunately in Nigeria the case may never get to court. So let the family members of the victims whether individually or collectively be they Nigerians or foreigners file a suit via their solicitors whether locally or internationally against the synagogue church for indirectly causing the deaths of their loved ones who could have “survived” had they been rescued “on time” when the first respondents came for their search and rescue operations which they are “professionally” trained to do but where “mystifyingly” prevented, hindered, attacked and driven back from the collapsed building by the synagogue church members & security. Why would I chase away my neighbors coming to help me put out the fire in my kitchen before it burns down the whole building except of course I have a “skeleton” in my kitchen cupboard I so desperately want to keep hidden even at the extreme expense of losing my entire building. That’s my logical analysis of the situation in that highly secretive cultish church where preserving their satanic secrets is more important than saving the lives of the people that went there for their false healing & miracles. They are legally liable for severe damages and loss of human lives. I strongly advice and recommend that the family members of the survivors can successfully sue them without fear or favor whether individually as a plaintiff or collectively as a class act for over $100 million (USD) or N500 billion (Nigerian Naira) damages in a court of law whether inside or outside Nigeria or even both. That way the synagogue will keep paying damages till it expires from the face of the earth as deterrent to other such churches and prophets who think that they can play with peoples’ lives as they do with their faith. Remember the antecedent of the previous “anointing water” stampede in Ghana that caused similar loss of lives? Once beaten twice shy, but twice beaten thrice smart! Brother Nosa, South Africans died there, we defeated apartheid, we know law. Nelson Mandela left us with a legacy, its time we use it. He can be fake or genuine, truth must be told, and someone must pay. I support strongly what you are saying, justice must be served. I think the most stupid goat is a fool like you who believe in the fake miracles of TB Joshua. Why did the fake Joshua not forsee the imminent danger and evacuate the building long before the tragedy. This incident was a true test to examine the real facts around Joshua’s miracles. It just proved that Joshua is a fraudster who loots money from ignorant people like you. Wake up and go find yourself a life. even says, in asituation like this, people tend to be emotional. Lives were lost there. Lets look at the Malaysian plane thing, the people responsible of tht plane continuosly updated with press conferences, and it gave a little hope. Im not judging TB Joshua, but its human to show face when tragic happens in your back yard. If your child comes for a holiday in my house and drowns to death in my swimming pool, would you rather i send you an sms to show my sympathy or would u rather I come and hold you and show how sorry i am. If the man of God can show his face, arrange a press conference, not necessarily telling us what happened, but atleast say something. Possible conspirancies may be eliminated. There are plenty of people working there, for sure some of them are now his enemies and he is probably not even aware. If the building was built shodily, obviously he had appointed a task team to manage that, but he remains responsible for his property. I hear ordinary church people construct there, are they trained and skilled, we dont know. TB JOSHUA, MUST SHOW FACE AND SPEAK PUBLICTLY, COS WRITE NOW, HE SEEMS LIKE A MAN WHO IS PROTECTING HIS NAME, AND AVOIDING A CRIMINAL OFFENCE. NEMA official spokesman Mr. Ibrahim Farinloye’s press report to Associated Press as admissible evidence and proof in a court of law that for almost two days (48 hours) from Friday to Sunday, synagogue church authorities (ostensibly acting under their prophet’s instruction as we all know that they would do nothing without their lord & master’s knowledge and consent especially in such grave circumstances) deliberately denied and hindered NEMA full access to the collapsed building site…this invariably led to the loss of so many lives that could have been saved because most of the building’s rubble would have been sifted through if the rescuers had been working round the clock day & night during those crucial 48 hours after the incident. If only they gave the dead just 48 hours to live…many of them will still be living! Excuse my grammer…Damn only 48hrs to Live!!! My submission is that perhaps only a few fatalities, possibly less than a “dozen” could have materialized in this incident and not over a “hundred” dead Christian brethren that did not need to die…May their innocent souls rest in the peace of Christ Jesus, Amen! This inciting, incensing and over bearing question: Why that “wicked” prophet did not want those “trapped” people rescued “on time” can only be answered by him when he is docked as an “accused” before an impartial judge. Perhaps he wanted to have as many “casualties” as possible before proper rescue operations can commence for evil reasons best known to him; or he was in a state of malicious damage, delusion and denial that his church authorities were capable of carrying out any meaningful rescue operation to save the lives of those people he knew only too well were still “trapped” in the rubble which is both ethically and legally unacceptable. Therefore he deserves a “fair trial” to conviction…unlike his victims whom he denied a “fair chance” to survive! Believe…If I were a professional lawyer I would have personally and single-handedly taken on this “evil-beast” of an African church and prophet legally speaking in the court of law right here in Nigeria and no doubt secure a guilty verdict and conviction. But I trust the indomitable fighting spirit of our South-African Christian brethren who lost many souls in this international incident will take up this international challenge and give us a good report and resounding victory as they did against Apartheid in Africa…Justice must be served and seen to be served to the glory of God! Great Mandela’s fighting spirit still lives in Y’all! Our first focus is on the lives lost. May the good God be with the families of the victims of this sad incidence. Just waiting to hear what really happened and the cause. Which contractor did the works and who did the design and who approved? Were the additional works part of the original design in terms of technical specifications? This is an eye opener and there maybe similar buildings which may not be according to required technical specifications which the government through their relevant authorities start inspecting all buildings where gatherings take place to safeguard people’s lives instead of waiting for people to lose lives and take corrective action. This should all African countries learn. THIS ATTACK ON SCOAN IS ANOTHER PROOF THAT PROPHET TB JOSHUA IS A REAL MAN OF GOD. I JUST FINISHED WATCHING THE CHURCH CCTV CAMERA PLAY NOW IN THE LIVE SERVICE. AND IT HAS SHOWN THAT A STRANGE JET HOOVERED THE BUILDING 4 TIMES BEFORE IS COLLAPSED. NOW ALSO IN NIGERIA , A NIGERIAN WAR JET USED TO FIGHT BOKO HARAM HAS BEEN MISSING SINCE 10;30 AM ON THE FRIDAY 12, OF SEPTEMBER 2014 AND WAS EXPECTED TO RETURN BACK BY 12: PM SAME DAY, NOW CHECK THE TIME DIFFERENCE AND VERYTING YOU WILL KNOW THAT THIS WAS AN ATTACK ON SCOAN BULIDING, FOR NEWS SEE BELOW OF THE MISSING JET. http://www.thisdaylive.com/articles/nigerian-air-force-jet-declared-missing/189006/ A WORD IS ENOUGH FOR THE WISE. A Real man of God? Why isnt the govt speaking publictly about it, so that we can assign a face to the words. I so wish there were Americans there. The UN needs to intervene now. Where are the aviation laws in Nigeria, that means, people or anyone for tht matter can just fly an aircraft, without proper arrangements for airspace. Who is doing airtraffic control there. The man of God is not infallible. He should not cast aspersions on an unknown enemy. The tragedy could be as a result of lack of quality assurance by engineers during construction. Any who opens his or her mouth to talk against man of God Almighty. Prophet TB Joshua in ugly situation, is a devil. Don’t attract the anger of God Almighty to yourself and your family. Go and read your Bible very well, starting from beginning to end and you will understand what it really means by talking against the anointed man of God Almighty. This man of God Prophet TB Joshua, I have been watching his teachings and his character and the act of love to many people. Exactly like our Lord Jesus Christ because, Bible said, He leave us an example that, we might fellow His steps. Tb Joshua never said, that he is Christ, he said that, he is a servant of Christ. Why all this talk talk? I see it as jealousy because God Almighty is using him greatly than others. What wrong has this man of God Almighty Prophet TB Joshua did to people? Nothing. For me, to die in the house of God Almighty is better than to die in the world. The dead ones are probably happy or sad they died there we dont know. its time he does what is Godly, appear in public so that we can stop this talk talk. Theres a lot i learnt from watching this man, I have prayed with him through Tv and things happened. Please take your capslock key to TB Joshua for deliverance. @ Mr Terrific, Hummm, you are not even scared of questioning God? You ask who make TBJ a man of God? ah, if u really wants to Know why dont u go to heaven and ask God himself? wait…… have u ever imagine if he’s a true man of God? how Thunder will fire u for questioning his anointing? Gosh!!!! who are u to ask such question? even if he’s a fake pastor, let God judge him himself, who are u to think u can fight for God? see if he’s a fake pastor or not, he’s better than some people calling themselves pastors n using the church money to buy jets, to build schools that the members can not attend. idiot like u sit, n typing rubbish when u are supposed to be in Scoan so that they can give u scholarship or work to keep u busy so that u wont be typing nonsense here. People like you already given your self to promote hate and lies, who makes people men of God? I think is God only God so if you want to know ask God . Thank God we’re seeing the beginning of the end of TB Joshua. God Almighty Himself is fighting TB Joshua and this is the time his adherents need to turn away from him. Why is he avoiding the camera? This is a tragic moment and nobody cares how anyone looks. Poor souls are still trapped in the rubble, some are severely injured, others are lying in the morgues dead and all the fool cares about is his appearance? No mention whatsoever about the poor victims of the tragedy. Even if he wants to deny about any death what about the hundreds of injured we’ve all seen? Why can’t he show concern for the poor souls and their relatives? I hope nobody buys that helicopter nonsense. Journalists, please, please, please if you get a chance to be close to this fool, shoot as many questions as possible at him. Nine minutes is too much time to waste with someone without getting any useful information. Be like foreign paparazzi. Throw out questions at him left right and center. Ask him annoying questions because annoying questions or comments always move someone to respond. All TB Joshua cares about is money. Does anyone know if a moment of silence has been observed at the church for the souls that perished? What kind of pastor cannot even offer a prayer for the victims of a tragic event at his church. This time round TB Joshua will not get away with these deaths. Last year they played a similar game when the Botswana Magistrate died at the church. This time, game is over. FOR ME I WOULD SAY, DO NOT JUDGE BECAUSE JUDGEMENT WILL BE UPON YOU. GOD HIMSELF CAN ALLOW SATAN TO TEST OUR FAITH. TB JOSHUA AS I KNOW IS A PROPHET . A TRUE PROPHET FROM GOD. MAY GOD REST THE PARTED SOULS IN ETERNAL PEACE AMEN. Interesting, I have watched the video clip above. And I listened to TB Joshua address his congregants a short while ago. I have also read the official SCOAN press release. NEVER at anyone time did TB Joshua say anything to do with a “UFO”. If you guys have something against TB Joshua, please stick to the plain truth facts lest you end up like foolish dogs barking at a flying bird. UFO = Unidentified Flying Object. He may not have used the exact acronym, but that is exactly what he described. Can you let me know how you think we’re making money? I must be missing something here. Oh Lord help us, this just gets worse and worse. And yet, in spite of this newest, most ridiculous claim, and his ridiculous behavior, his followers will still bare their teeth and snap at anyone who points out the errors. Range of an Alpha Jet: 1,080km. Distance Yola to Lagos: 1,100km. Maybe it just ran out of fuel? U funny that he did not feel remorse not says sorry for what happen. I think u did not watch or listen the d video u uploaded on your site here. He did apologies and voice sounds remorse and sorry. He is a strong man cause he knew enemies will take advantage of the situation to attack his personality. Definitely you are one of them . oh God mighty have mercy on those who lost there lives on that collapse building. indeed it is the work of devil,when some one is doing what God told him to do there are so many problems in life.prophet TB Joshua is a man of God, no matter what is happening in his life he was send to do the work of God.we shall pray with him together for more anointed, we shall fast for his grace from heaven. shame on you devil for killing souls, God will add more spirit on him. He thinks *everybody* has shut their brains down like his followers. I’m so glad the reporter recorded his words so that he cannot deny them. 1. The building collapse happened 45 minutes after the last appearance of the plane. Do bombs work that slowly? Does vibration from aircraft work that slowly? That’s the first problem with that video. 2. Lagos is a massive city with an international airport and probably a pretty large base of security forces. I live in a very small city. We have a small airport. There is *constant* air traffic on weekdays. And not just planes landing and taking off, but traffic helicopters, hospital helicopters, and national guard helicopters on training flights. There is nothing “strange” or mysterious about aircraft appearing in the skyline over SCOAN, nor anywhere else in the city of Lagos. That’s to be expected. Moreover, looking at a map, SCOAN is located a mere 2.5 miles from an international airport, and just beyond the airport is a government reserved area. What would be “mysterious” about aircraft over and behind SCOAN property? NOTHING. 3. In that same vein, the airport here means that the flight path for take offs and landings goes directly over a major shopping area. many, many buildings. Planes of all types, helicopters, and even small jets fly very low over a 6-story hotel that is across from the airport as they come in for a landing. That hotel, and every other building in their path, has stood firm for years of this. Moreover, every summer there is an air show of military jets. We have a week of our windows rattling while they’re here, practicing and doing the shows. Have they caused any building collapses? No. Because any building that isn’t fit to withstand a bit of vibration is not fit to be inhabited. And As you mentioned in the initial post, this still places the fault directly with SCOAN, and with TBJ as the leader. With multimillions in his pockets, he surely has the means to have his property built to code, appropriately designed and engineered correctly. As many as are talking against the man of God Almighty Prophet TB Joshua because of this problem will never go free from the anger of God Almighty. Continue written and continue talking. What you wish to others, God will use to you. That’s fine with me. I wish for the victims to see justice for the negligence that caused their suffering. I wish for the truth to be revealed. I wish for people to be rescued from the captivity of the cult that is SCOAN. I do not involve myself in making curses against others, as is common practice among those in SCOAN. So your little cliché doesn’t bother or scare me at all. Last I checked, we were not part of the team who constructed the building, the building collapsed like it had no foundation. Lives were lost and all you can think about is the man of God. Let me tell you one truth, just pray something like this should not happen to your family or dear friend cause I wonder if you would have the guts to say what you said if your family was involved. Man of God this, man of God that, they are trying to bring down the man of God. What about the people who lost their lives, thier families, some are mothers, fathers, children what would their family do. All you talking about is a man of God. So much for let Love Lead. Firstly -TB Joshua is just protecting his own image and ministry, by chasing the press and emergency workers away. He is also trying to protect his own image through concocted lies and secrets. It is all about him and himself. I have not heard a word about Jesus. Secondly -He is more worried about his earthly building than the people who lost their live or got hurt. He is rambling on, holier that thou, about not seeking the gifts (building) but the giver (Jesus), but not a word of compasion or prayers or help from him to them (Jesus people) or to their families. Even our own families there, were kept away from us. He could not even tell them to phone us, confirming that they are ok? No, everything is just about his image and his building. Nothing about Jesus or His people! If you cannot or will not see who he really is then stay blind and follow him to hell. I thnk you guys are saying d fact. 39 dead so far and yet they are trying to cover d truth without showing sympathy to the bereaved. Am a nigerian and its being reported today that lagos state governor has visited the site of the collapsed building and have instructed security agents to be stationed there and to arrest anyone who tries to hinder rescue efforts be they scoan members or whoever. Some nigerians believe that the deaths are not unconnected with occult rituals/blood sacrifice as is somethings done in occultic churches. I dont want to jugde anyone but am kind of wondering why is it that tb joshua did not see this coming becos he use to make prophecies about things to happen in the future but how come he did not see what is to happen in his own compound. I dont believe the collapse is as a result of a terror attack but its most likely to be from poor foundation or weakness in the building construction process. I am a christian and i can tell you that 98 percent of so called men of God in nigeria and africa are fake, its now a common thing for them to acquire satanic & occultic powers to work lying wonder. Its not all about jesuschrist or wining souls for christ but its all about the money. The lives of the injured and the dead counts for nothing to scoan. They are busy trying to cover up their negligence and failure to erect a standard structure with lies. Its all a hype. May God help us all. We are really in the end times. Lets look to jesus christ the giver of life,salvation and miracles and lets cease to look unto man. Scoan building collapsed…You know guys careless diagnosis or treatment may result eternal life or eternal death hence we are not designed to judge, because one day we will face our own judgement before the throne of God. Furthermore it was another way by which the enemy could sow his seeds of hate and discord the body of Christ..He always wanted his works to be highlighted and not the works of God.The crux of the matter therefore is that…at all cost we should never yield but remain firm to withstand his dirty tactics ..Dont be judgemental. Your breaking the heart of our Savior Jesus Christ…. Come to think of it, Blaming an aircraft is actually blaming the government. How I pray the government reacts with all its might and shut this clown once for all! It will be very revealing to see what happens. If SCOAN aren’t made to pay serious consequences, it will show that they are above the law and the government can’t control them. He should have been arrested for his Boko Haram stunt, and his anointed water Ebola cure – if something serious doesn’t happen now, it does not look good. @tbjoshuawatch you are as stupid as a goat and as jobless as any idle thing you can imagine about. kindly repent and stop talking againts a Man f God, if realy u are a christain. from all your statements i can see you are a demon. and enemey of SCOAN. I am really disappointed and heart broken. Maybe the gentle souls lost rest in perfect peace. It’s not because we are special but by the grace and love of God we are still alive and standing today. God help us, we need you to intervene, Father save us. Maybe you should wait till all the facts are out until you make such statements. Let no one play to the gallery or play games with peoples lives. It is a great calamity and pain to loose a loved one in such a careless manner that was totally avoidable. Those supporting tb joshua/scoan are selfcentred, callous and brainwashed bigots,if they have lost a loved one in the building would they still speak in defence of tbjoshua, as rich as scoan is they still did not deam it right to erect a standard approved structure. People were living in the building and at the same time work was going on on top the building then tell why such building would not eventually collapse? For Gods sake this is not all about tbjoshua or his image. Its all about telling the truth.men,women and children have had their lives brutally smashed out by that ill-fated building that could best be described as a time bomb waiting to explode. The lagos state agency in charge of building approval have stated categorically that scoan did not obtain any form of approval to erect the building neither did they seek approval to add 4 more storey to the initial 2 storey building design. The foundation of the scoan building was meant to carry 2 storey,not 6 storey and that is the most probable reason why the building collapsed. By the way the missing nigerian airforce jet have been found to have crashed in a village in gombe state. So the story of bokoharam using a missing jet to attack scoan building with chemical weapon does not hold water.even the bible says in psalm 11:3 if the foundations be destroyed,what can the righteous do?. Becos of corruption i know that nothing would be done to about the negligence that caused people their lives,it would just be swept under the carpet. But God have allowed this to prove that tbjoshua is not God but an ordinary man so lets his follower stop to glorify him as GOD. For if he were God he would have being able to prevent this from happening. I think tbjoshua and his followers should start praying for the injure to recover speedily and should start accepting responsibility for the mistake of a building that have caused the death of innocent souls,they should stop looking for cheap excuses to exonerate themselves. They should show sympathy to the victims and support them in all ways,instead of defending themselves by covering up the truth. tbj supporters are Blind because despite the fact they watched the cctv footage they still choose to shut their eyes from reality and decided to see an imaginary plane, grenade and explosion. They are dumb because they refuse to speak the truth, they are deaf cause even tho they hear the truth they choose to shut their ears, they have no sense of smell cause a reasonable person who know something smells fishy about, tbj and everything he stands for, and lastly they have no feelings, cause if they had their thoughts, words and actions would be channeled those who lost their lives and those who got injured in the collapsed building and not tbj’s image.Generally Scoanites have all their senses shut and choose to live in the world of the self claimed prophet. Time would tell. Ej where is your problem?why you rejoicing for what happened?even they are blind where is your problem?more you hated him more we love him,we made our choice to the better,or worse we will support our prophet,those who want to go they are free,we we are staying with him,I think you should be celebrating if you hear that tbjoshua were in the building and die,why you guys have not a heart why you so jealous on tb joshua,you will never stop him,you are wasting your time,your campaign is zero,tbjoshua is helping people,broken home be reconcialiat by man of God,window,disable,poor,fees for school,if you can not believe on him believe at the work he is doing,changing soul to christ,you ej what good have you done to other?just critisized,could you stop because one day you will regret,repent,find something nice to do than staying in internet,a Bon entendeur salut. Lol, I am rejoicing? Keep following your MAN OF GOD I hope it isn’t when you are old and grey you would realise that you’ve been a follower of Man and not Christ. Everybody needs to repent including you. So please spare me those details. Stop supporting your prophet, channel your support and voice to those who died or are injured. When will we understand that a true man of God WILL be attacked, in order to diminish his credibility? The Bible makes that so clear and matter of fact that’s exactly what the owner of this site is doing. Claiming that TB Joshua called it a UFO attack is beyond honest reporting and a twisting of words to make TB Joshua look foolish. He knows very well that people associate UFO’s with aliens etc. Don’t forget that the Apostles were arrested for healing the crippled man at Solomons temple, because those Pharisees had the very same heart of unbelief as the owner of this website has and didn’t recognize the work of the Holy Spirit when they saw the evidence right before their eyes, but instead of glorifying God would rather ascribe God’s work to Satan. Troubles will always be the portion for true ministers of the gospel according to 1 Cor 4:12 and 2 Cor 11. Paul says that a true minister’s character will be trampled upon and made to look like the “filth of the world” and isn’t that exactly what they’re doing here on this website? 2 Cor 11:23 Are they ministers of Christ? (I speak as a fool) I am more; in labours more abundant, in stripes above measure, in prisons more frequent, in deaths oft. I guess as a follower of man of God as you claim to be you should respect and mind your language Don’t you feel shame to call your fellow human a goat? After all the good things he has done in the lifes of people so is this how to say thank you to the man of God by insulting him. You only see the bad now but u dont remember the good he has done to your families, some people are where they are today beacause of him. Open your eyes. Prophet TB Joshua is still a man of God and a prophet of God. What happened can also happen anywhere in the world. It was just an attack accident. Love Never Fails. Save me,O Lord,from lying lips and from deceitful tongues. What will he do to you,and what more besides,O deceitful tongue? Woe to me that I dwell in meshech,that I live among the tents of kadar ! Too long have I lived among those hate peace. I am a man of peace;but when I speak they are for war. How you foes rear their heads,with cunning they conspire against your people;they plot against those you cherish,come they said,let us destroy them as a nation that the name of Israel be remembered no more. With one mind they plot together,they form an alliance against you. Papa tb joshua no worries God is in control. God is still saying something. He is the potter and we are his pots. What He does through the Man of God prophet TB Joshua shall remain a mystery that He only can unfold. Pertaining to why Prophet TB Joshua could not prophesy or see this coming, we must be mindful that a prophet can prophesy only what God reveals to him. It is not surprising that apart from Prophet TB Joshua even those who profess to be, or are true prophets God did not chose to reveal this to them. Jesus said if they have persecuted him, they will persecute his followers well. God allowed Apostle Paul to be afflicted so that he can not be conceited. He did not consult Apostle Paul prior to the affliction. All this was to keep the predetermined plan of our Almighty God concerning his creation on track. We should bear in mind that Jesus brother, Jesus Cousin as well as Jesus himself had to die for the salvation plan of God to be fulfilled at their respective appointed times. This is yet another event taking place at God’s predetermined and appointed time. Prophet TB Joshua and the victims of this incident are at the centre of the storm this time. May they be glorified that our Lord be glorified in them in Jesus name. Amen and Amen. This man makes predictions about football and pop music! About some aircraft crashing in remote China and yet he could not see the mysterious plane hovering aboves his shoddy building. God is punishing him for using his Holy to name to make money. Which prophet became rich in the bible for preaching the word of God? Lenny you don’t know what you are talking God have mercy on you,read you bible very well,do not write by pleasure,tbjoshua did nt planed killing those people even himself is very concern,he is human being it an accident planing by lucifer and all the demons to destroy. Man of God but his a liar God is in control for everything no your talking,leave the matter in the hands of authorities,do not jump to the conclusion what kind of Christian are you?a Christian with hatred,stone heart,big mouth,lying,I never saw in the bible a Christian fighting another Christian,we supposed to love,even or enemis,it happen to tbjoshua today May be tomorrow will be you,show a little respect,value and classic,quel genre du comportment,meme les paiens n’agissent pas cela,pourquoi se rejouir du malheurs des Autres . Oh aimee, no word for you. Whoever that is sponsoring this website you can’t make money through promoting hate on someone that God have used to change lives and mend broken homes and give hope to the hopeless. a man who invest every saint has to help others and not to buy collections of private jets, this is how I pass my judgement and I think is fair. take my advice seriously , shut this site ore use it for something better. Oh yeah, But Tbj is free to house people in a Paper Hotel and collect between 800-1000 dollars. Even atheists give to the needy, does that mean they know christ. My dear, all my life I have been hearing news tagged as rumour about Tbj, and in every rumour there’s always truth. Different people at different years can’t just make up things to bring down a self claimed Man of God. God gave us brain in our head to reason and discern so we will not be deceived. If God didn’t want us to reason, we would have been more like Zombies. Oh well Tbj’s actions are speaking for him, and how long would you insult people, and threaten people with baseless words. Time will always tell, nothing can be hidden under the sun forever. Oh, that’s right. We are NOT supposed to judge ANYTHING……….especially, a man of God…….even though he isn’t a man of God, but, a DEVIL leading people away from God’s Scripture and right into WITCHCRAFT, NEW AGE, AND THE ARMS OF THE ANTICHRIST. I am sick of hearing this LIE, when we ARE SUPPOSED TO JUDGE in Righteous Judgement with the Mind of Christ, and we get that thru the Scriptures. Just let these WOLVES come in and devour the sheep………and be so loving and hospitable to them, while they spout LIES AND WITCHCRAFT, distort the Scriptures, and fleece the flock. DON’T JUDGE THEM, just help them kill the sheep. Keep defending these WOLVES and you will end up with them at the damned. Celui qui parle beaucoup ne manque pas de pecher,mais celui qui retient ses levres est un homme prudent. Pls 2minute silent 4 the people that lost there life,…..may there gentle soul rest in peace in JESUS NAME, AMEN. this is a letter to GOD through our lord Jesus Christ. jst write amen. i think what happened in Nigeria- Lagos : TB Joshua’s it can happen any in the world. we should keep on paraying for all the families of those people who have lost their loved ones, and as well as those who are still missing and in the hospital. As christians we understand that it can happen any where in the world, i am behind TB Joshua and his members with prayers, and i want to urge all the people to continue praying to God, and should not give up. May God give TB Joshua and his team a courage to stand, it will pass like any disaster or storm. James Zoko, Rev. As a Prophet of God can I tell you that ,what happened to the Synagogue Church of all Nations was a mirracle. By right over a million people were planned to die on that day and event.However the the faithfulness of the Prophet saved the situation.This T.B. Joshua that you are pointing fingers on has in the past saved your continent Africa and the World from similar and even worse disasters.You cry of 17 lives that have been lost, what about of the billion lives that He has saved and continued to save.It is a shame,that being carnal and babies in the things of God you try to Judge God ‘s Generals.The 17 people that you are saying lost their lives are rejoicing and celebrating that they gained LIFE.Those people are with the Lord as I write to you and they are even feeling pity for you blindness,ignorance,unbelief and hardness of heart.I call for NOSA very specially to repent ,because I see a wave of barreness and early dearth overriding your family especially in the next generation because of the words you said against GOD via the MAN OF GOD.You will have to write your apology on SCOAN ‘s social networks publickly as you have attacked them. God sees everything that is hidden. And God knows who is wrong and who is good. What we have to acknowledge is a matter that we are experiencing people whom many have been deceived by about to be caught of their doings. We believe that God exists and do exists for the good of His creation. There are many things which T.B. Joshua has claimed to have been foreseen before they happen. And the worst part of it, he revealed what he has foreseen after it has already happened. I come to ask myself why he does that? I have never heared of T.B. Joshua claiming to have prayed for any bad vision which he claims to have foreseen and has stopped. No matter what, we are all a creation of God, and God is the only one who has power over us. And keep in mind that, no one will add what is written in the Bible. The only people we can call prophets are those which are in the Bible, not which we see roaming around the world today looking for money. NO! If we read the Bible well, it tells us, “there shall be false Prophets after me, and they will deceive even the chosen ones”. This means that after Jesus Christ was the last Prophet, and what follows were apostles. So if you wee yourself claiming to be a prophet, then consider yourself among the circle of the Beast in Revelation. Considering the recent collapse of the Building, Joshua himself is involved. He made a trick to his followers so as to earn more spiritual emphasis. But, T.B Joshua is just a mere African, who can now be taken to task by the law. I doubt that he might be one of the master-minders of the collapsed building. When did the book of Revelation was written, or Revelation is it not a prophecy of what will soon happen. The version of John in the Bible.